Below are extracts from a report written by IMF colleagues: Krzysztof Krogulski, Robert Sierhej, and Aaron Thegeya. Although Poland has enjoyed strong growth and steady income convergence with the EU over the last two decades, important disparities persist at the regional level. Per-capita income is higher in the west—which is integrated into the German supply chain and enjoys higher levels of FDI—than in the east—where the economy depends more on less productive agriculture. Despite strong overall economic growth, the east has not been catching up to the west. This chapter identifies policies to increase productivity in the east, reduce regional income disparities, and promote overall income convergence. This would require improving educational attainment and reducing skill mismatches in the east, scaling up public infrastructure to attract investment to less productive regions, and facilitating labor mobility. Despite strong economic performance over the last two decades, there are significant and enduring income disparities between western and eastern regions of Poland. These disparities are strongly correlated with labor productivity differences. While labor productivity growth in poorer eastern regions has been driven significantly by structural transformation, in wealthier western regions it has been driven by higher investment and integration with the German supply chain. Education and labor market conditions had a significant impact on labor productivity growth across regions. Similar growth rates in labor productivity across regions have prevented eastern regions from catching up to western regions. The analysis of regional productivity determinants points to policies that could be conducive to regional productivity convergence. Support structural transformation and boost productivity in agriculture: Significant room remains to boost labor productivity growth within poorer regions by supporting the reallocation of labor from low-productivity agriculture to higher-productivity industry and service sectors. To unleash the potential for such structural transformation, a review of incentives pertaining to employment in agriculture would be appropriate to identify mechanisms that may encourage people to stay in low productivity farms. In particular, the highly subsidized pension scheme for farmers could be reformed to gradually align it with the regular system to discourage inefficient farming motivated by pension arbitrage. The more productive farms in western regions tend to be larger, so there may be merit in promoting consolidation of agricultural production also in the poorer eastern regions to exploit the economies of scale. In this regard, moving from the current agricultural taxation based on farm size and quality of land to an income-based tax would reduce disincentives to scale up farms and help define the base for social security contributions. To facilitate structural transformation, such reforms should be accompanied with measures to address skill mismatches and bottlenecks in labor mobility, as described below. Encourage labor mobility and reduce structural unemployment: Decomposition of productivity growth shows that the contribution from reallocating labor across regions has been relatively minor. This suggests bottlenecks in labor market mobility that could be addressed with proper policies, for example, by improving the functioning of the housing rental market. Currently, the rental housing market in Poland is shallow, discouraging labor relocation. Econometric analysis also suggests that high structural unemployment negatively affects regional productivity growth. While a declining working age population should generally reduce the unemployment rate, addressing high structural unemployment in less productive regions would require greater investment in active labor market policies to improve job searching efficiency across regions, upgrade skills, and reduce skill mismatches. Attract investments to less productive regions: Empirical findings show that higher FDI is associated with faster regional productivity growth. FDI is more prevalent in wealthier regions, and this pattern needs to change to support regional productivity catch-up. Some factors important for investors could be altered by government policies to support such a change. Specifically, strengthening transportation networks in poorer regions would help, and better targeting of EU funds could support this process. Furthermore, investor surveys suggest that access to skilled labor is important for location of projects. In this context, investing in education and tailoring it to local development needs is important; aligning vocational curricula closely to the needs of industry would facilitate the absorption of new production methods and technologies. While local governments’ role in boosting productivity appears less statistically significant, it does not imply that quality of local administration is irrelevant. 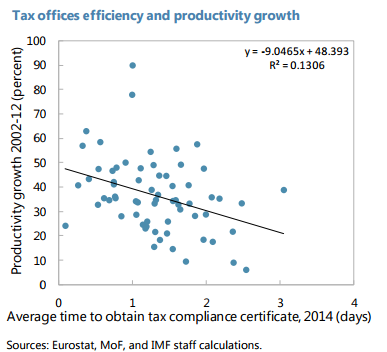 For example, data suggest a positive correlation between regional productivity and the efficiency of local tax administration.